The spring has long been an indispensable component in the manufacturing of products. Yet, for most, the thought of how springs are made and their purpose only comes to mind if they take a pen apart or see what’s behind a tire when changing a flat. Nevertheless, applications for springs are near endless and are found in just about every industry. They are sturdy, strong coils of metal that can return items to their original position but can also be used to absorb energy and store energy in a wide variety of applications. Springs change shape in response to an external force and returns to its original shape when the force is removed. The energy expended in deforming the spring is stored in it and is recovered when the spring returns to its original shape. You can find springs working in everything from vehicle parts, cell phones, garage doors and screen doors, to clocks, mouse traps, trampolines, and pogo sticks. 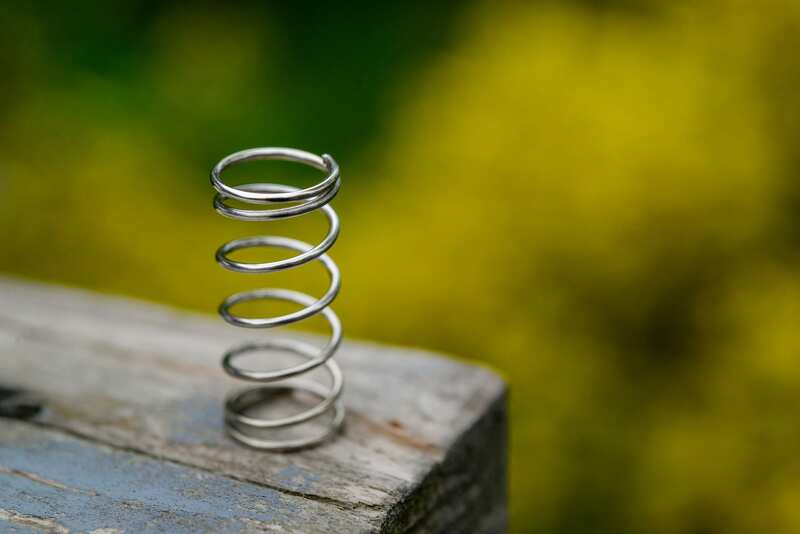 More than likely, a compression spring is what comes to mind when first thinking of a spring. The tightly coiled helical wire is designed to resist compressive force when applied to its axis. The energy of a compression spring is stored in push mode. Compression springs can be cylindrical, oval, conical, convex or concave. Whatever the shape, when the force of the load acting upon the spring compresses it, the reaction of the wire is to push back the load and return to its original shape. There are also extension springs and torsion springs. Extension springs have hooks or loops on either end. Energy is released when the spring is stretched or pulled through tension. It can absorb or store energy, as well as create resistance to a pulling force. They are found in carburetors, garage doors, trampolines, and washing machines among other applications. Torsion springs work by a torque or rotary force, and the end of the spring rotates through an angle as the load is applied. As they wind up, torsion springs reduce in diameter and their body length becomes longer. It exerts a twist like that found on the hinge of a screen door or a simple clothespin. Yet, a spring is no more than a straight length of wire that has been coiled. You could even make your own spring from a paper clip. Simply straighten out the clip, coil the wire around a pencil and voila! You have turned a paperclip into a spring. As simple as it sounds, bending the wire around the pencil and forming it into a spiral was done through a degree of energy. That energy is now stored in the spring you have created. On a greater scale, the length and gauge of wire and the metal used combined with the amount of winding will determine how easily a spring can be either squeezed or stretched and its application. The process of winding creates energy. Atoms are being shifted in the spiral to release or store energy when needed. What Are Springs Used For? The use of springs can be traced back for thousands of years. From a non-coil tree branch used to construct a bow and arrow to catapults, humans found ways to store energy in spring-loaded devices. The development of layered leaf springs was used on Egyptian pharaoh Tutankhamen’s carriages. Not until the fifteenth century did the coiled spring arrive with the widespread advent of the clock. A mechanical clock stored energy by tightening its spring which, when gradually loosened, pushed the hands around the clock face. In 1676 British physicist Robert Hooke conceived of what we now know as Hooke’s law. He postulated that the force a spring exerts is proportional to its extension. That principle would, in many ways, drive the Industrial Revolution. By the 19th century, springs were mass-produced. Spring usage rapidly expanded with the development and improvements of steel production which allowed for quick and innovative advancement in spring technology. Over the years, new discoveries in metallurgy have expanded the applications for springs. Some heat treated ferrous metals and alloys strengthen metals after being coiled. The right mixture of alloys provides higher ductility and resistance to environmental embrittlement of the metal. Wire used to manufacture springs is made from different materials depending on the application. The most common type of material is high-carbon spring wire, alloy steel wire, and stainless steel wire. Non-ferrous, or copper-based, alloys like phosphor bronze or beryllium copper are also used where good electrical properties and corrosion resistance is required. In today’s world, as throughout history, uses for springs are found in a wide range of applications. They are a vital component for industry and manufacturing of parts throughout the globe. You need look no further than a pen or car, but if you do chances are you’ll likely find the device has a spring. For more information about springs, contact us at James Spring & Wire today!